Auphonic Multitrack takes multiple parallel input audio tracks, analyzes and processes them individually as well as combined and creates the final mixdown automatically. Leveling, dynamic range compression, gating, noise and hum reduction, crosstalk removal, ducking and filtering can be applied automatically according to the analysis of each track. Loudness normalization and true peak limiting is used on the final mixdown. Auphonic Multitrack is built for speech-dominated programs and is available for Mac OS X 10.6+ (64bit) and Windows 7+ (32bit or 64bit). All included algorithms were trained with data from our Web Service and they keep learning and adapting to new audio signals every day. Auphonic Multitrack is most suitable for programs where dialog/speech is the most prominent sound: podcasts, radio, broadcast, lecture and conference recordings, film and videos, screencasts etc. It is not built for music-only productions. For more details about our multitrack algorithms please see Multitrack Post Production Algorithms! Correcting Loudness variations within each track that may be caused by changing microphone distance, different songs in music tracks etc. For more details see our Multitrack Audio Example 1, Multitrack Audio Example 3 and our Singletrack Adaptive Leveler Examples. If audio is recorded with multiple microphones and all signals are mixed, the noise of all tracks will add up as well. The Adaptive Noise Gate decreases the volume of segments where a speaker is inactive, but does not change segments where a speaker is active. All parameters of the gate (threshold, ratio, sustain, etc.) are set automatically according to the current context. This results in much less noise in the final mixdown. For details and audio examples see Multitrack Audio Example 2 and the other Multitrack Audio Examples. When recording multiple people with multiple microphones in one room, the voice of speaker 1 will also be recorded in the microphone of speaker 2 and creates a crosstalk (spill), reverb or echo-like effect. Our multitrack algorithms know exactly when and in which track a speaker is active and can therefore remove the same signal (crosstalk) from all other tracks. This results in a more direct signal and decreases ambience and reverb. Listen to the details in Multitrack Audio Example 4 and the other Multitrack Audio Examples. Auphonic automatically decides which parts of your track should be foreground or background: Speech tracks will always be in foreground. In music tracks, all segments (e.g. intros, songs, background music, etc.) are classified as background or foreground segments and mixed to the production accordingly. If our classifiers do not work for your content, it is possible to force the track to be foreground or background. We also support ducking to automatically reduce the level of a track if speakers in other tracks are active. This is useful for intros/outros, translated speech or for music segments, which should be softer if someone is speaking. Listen to the Automatic Ducking Example and to the Fore/Background Audio Example. Our Noise Reduction algorithms remove broadband background noise in audio signals with slowly varying backgrounds. First each track is segmented in regions with different background noise characteristics, then a noise print is extracted in each region and removed from the audio signal. In automatic mode, a classifier decides if and how much noise reduction is necessary. The Hum Reduction algorithms identify power line hum and all its partials in each track. Afterwards the partials are removed as necessary with sharp filters. For more details and audio examples see Noise Reduction, Hum Reduction and Multitrack Audio Examples. Global Loudness Normalization calculates the loudness of the final mixdown and applies a constant gain to reach a defined target level. The loudness is calculated according to latest broadcast standards (ITU-R BS.1770) and Auphonic supports loudness targets for television (EBU R128, ATSC A/85), radio, podcasts, mobile and more. A True Peak Limiter, with 4x oversampling to avoid intersample peaks, is used to limit the final output signal to the selected maximum true peak level and ensures compliance with the selected loudness target. For more details see Global Loudness Normalization . An adaptive High Pass Filter cuts unwanted low frequencies, depending on the context (speech, music or noise) of each track. For more details see Multitrack Adaptive Filtering . The Auphonic Multitrack Processor includes a Parallel Task Queue (multi core processing) with configurable CPU, RAM and disk usage. Just drag and drop your tracks into the program window and the multitrack production will be processed in parallel (with each track processed on its own core), using your current settings. During processing, the progress is shown in the application. All your current settings (audio algorithm parameters, parameters of individual tracks, output file options, intros/outros, warnings, hardware settings, etc.) can be saved as Presets. Audio Processing Statistics of the master and individual tracks display details about what our algorithms are changing in your files. They can be used to check compliance with Loudness Standards (Program Loudness, Maximum True Peak Level, LRA - see EBU TECH 3341, Section 1 ) and certain regulations for commercials (Max Momentary, Max Shortterm Loudness - see Section 2.2). It also shows how much our Adaptive Leveler changes your levels (Gain mean, min, max), statistics about your input tracks (SNR, Background and Signal Level) and much more. Statistics can be exported as files (manually or automatically) in machine readable JSON, in YAML, or in a human readable text format. The exact file format is the same as in our Web Service and is documented here. 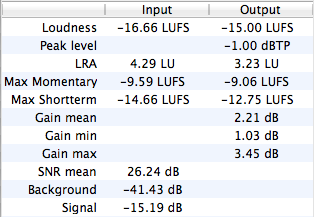 It is also possible to setup Warnings for quality control or as alerts to manually check problematic segments in your audio: for example, you don't want a MaxMomentary loudness >= -19 LUFS or an Output Loudness Range >= 20 LU. Warnings will be displayed in the application and are also exported to processing statistics files. We support a wide range of input and a limited selection of output file formats. Sample rate and bit depth conversions are using the high quality resampling and dithering algorithms of SoX. Please use lossless audio formats whenever possible. It is also possible to export all individual, processed tracks as separate files in WAV, WAV (float) or FLAC format for further editing. Please see Auphonic Multitrack Help for a descriptions of all available parameters and for further help. Empty start screen of the Auphonic Multitrack Processor. The Master Audio Algorithms Box (bottom left) shows basic controls to enable/disable the Adaptive Leveler, Crossgate, and to select a Target Loudness level. Drag and drop files or folders to load audio tracks. Now four tracks are added to the Auphonic Multitrack Processor and we are ready to run. The Track Audio Algorithms Box (top right) shows controls to configure the algorithms for a specific track. Our Noise and Hum Reduction algorithms can be disabled, set to Auto our set to a specific reduction amount in dB. Possible values for the parameter Fore/Background are Auto, Foreground, Background or Duck this Track. During processing, a progress bar is shown at the top right. Audio Processing Statistics of a selected track are displayed in the right table: the format is exactly the same as in our web service and is documented here. Statistics can be exported as files in JSON, YAML or in a human readable text format. After processing, you can see the Audio Processing Statistics of the generated master output file. Change the name in Output File Basename before processing to set the exact output filename. The Algorithm Details Preferences might be used by audio experts to manually adjust details of the loudness measurement algorithms and to select a custom maximum true peak level. If you don't know what that means, please leave it at the default values! 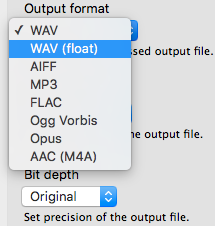 Preference tab to select the Output Audio Format. The final multitrack mixdown will be encoded into this format. Details about the location of the final mixdown Output File. It's also possible to export the individual, processed tracks for further editing and to export processing statistics. 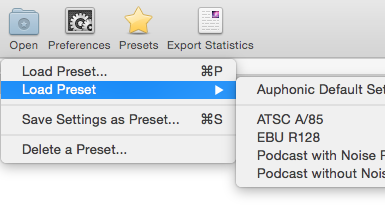 Select an Intro and/or Outro file, which will be added at the start/end of your multitrack production. Warnings can be used for quality control or as alerts to manually check problematic segments. They will be displayed in the Auphonic Multitrack application and are also exported to processing statistics files. Adjust RAM, CPU usage and the temporary processing directory of our audio processing task queue. We offer two licenses, depending on how you use the Auphonic Multitrack Processor. If you want to buy a site license, have any questions or other licensing needs, please contact us at licensing@auphonic.com. All bug fixes and software updates up to the next major version can be downloaded and installed for free. IMPORTANT: Users of the Auphonic Leveler will get a discount of -33% during the payment process! You are an individual, using the software for personal and non-commercial use only. Cannot be licensed by a business, university or other organization. This license is valid for a single human user only. Valid for Mac OS X and Windows versions of the program. You are a business, university or other organization. You are an individual, using the software for commercial purpose and your annual gross revenue exceeds 15.000€ ($20.000). This license is valid for up to 5 users. Please try and evaluate our program and algorithms fully before purchasing. All purchases are final! All prices are listed in Euro (€) and US-Dollar ($), without taxes. Sales tax or VAT may be charged, depending on where you live. Companies from Europe can use their VAT ID (UID number) to purchase without VAT. To download and buy the Auphonic Multitrack Processor, you are required to register for a free Auphonic account. Auphonic Multitrack includes our Multitrack Audio Algorithms only, they are exactly the same as implemented in our Web Service. Processing is done offline on your desktop computer: no need to purchase Credits or to upload/download files. Please see our Desktop Programs Help for further remarks and distinctions! Algorithm section for one track in our online production form. All algorithms are also included in the Auphonic Multitrack Processor. Master track algorithm section in our online production form. All algorithms are also included in the Auphonic Multitrack Processor. This program is for multitrack productions only (you need at least 2 tracks/files)! If you need to process singletrack productions, please use the Auphonic Leveler. Metadata (Tagging), Chaptermarks management and Automatic Content Deployment features of our Web Service are not included in our desktop apps! Create a free Auphonic account and evaluate the algorithms online. Download and test a 7 day trial version of the Auphonic Multitrack Processor. The Auphonic Singletrack Post Production Algorithms are optimized to process stereo or mono master audio files of a final mix. However, many audio productions consist of multiple tracks: speaker tracks from multiple microphones, music tracks, remote speakers via Skype, etc. The Auphonic Multitrack Post Production Algorithms are built to use all separate tracks of a production, will process them individually as well as combined and will create the final mono/stereo mixdown automatically. Each track must be opened as a separate file. We do not extract multiple tracks from a multichannel input file. All tracks are mixed in parallel and must start at the same time: the length of each track might be totally different, but they have to start at the same time. NOTE for Audacity users: The multitrack export in Audacity is unfortunately a bit confusing: If your track does not start at the very beginning, you have to insert silence before it starts, otherwise the offset will be incorrect in the exported tracks! Don't mix music and speech parts in one track/file. Put all music segments into a separate track. Please try to put each speaker into a separate track as well. Auphonic Multitrack is not built for music-only productions. It is most suitable for programs, where dialogs or speech is the most prominent content: podcasts, radio, broadcast, lecture and conference recordings, film and videos, screencasts etc. Take a look at our Multitrack Audio Examples to get a better idea what we can do. We do not change the stereo panorama of individual tracks – please adjust it in your audio editor before using our multitrack algorithms. Mono tracks are mixed in centered. If all your input tracks are mono, the processed output file will be mono as well! If you want to keep the ambience of your recordings, try to deactive the Adaptive Noise Gate or Crossgate. How should I set the Fore/Background Parameter? First, try leaving it at Auto. Then Auphonic automatically decides, which parts of your track should be in foreground or background: Speech tracks will always be in foreground. In music tracks, all segments (e.g. intros, songs, background music, etc.) are classified as background or foreground segments and mixed to the production accordingly. See Fore/Background/Ducking Settings and Fore/Background Classifier Audio Example. Set it to Duck this track, to automatically reduce the level of this track when speakers in other tracks are active. This is useful for intros/outros, translated speech or for music segments, which should be softer if someone is speaking. See Audio Example 5 / File 1. Set it to Background, if the whole track should be in background: background music, ambience recordings, just some background sounds, etc. See Audio Example 5 / File 2 to get an idea. If you set it to Foreground, all segments/clips of this track will be in foreground and will have a similar loudness as speech tracks. However, each segment/clip of the track (songs, intros, etc.) will be leveled individually, therefore all relative loudness differences between clips in this track will be lost. Use the option Unchanged (Foreground) if you do a lot of complex editing in your audio editor and don't want that Auphonic changes anything in this track. All relative volume changes are preserved in this mode and foreground/solo parts of this track will be as loud as (foreground) speech from other tracks. We also build custom versions of our programs and algorithms on request!